The number of exploration and production rigs working on the oil-rich North Slope should reach its highest level in 20 years this winter, state officials say. Oil field employment is higher than last year, modestly, but a first in more than four years. And the state just had one of its strongest North Slope lease sales in recent history. Those factors and others show the recent plunge in oil prices has not dampened industry’s expectations for the region, amid newfound interest in a little-tapped geological formation, the Nanushuk, state officials indicated in a meeting with the Senate Finance committee last week. But with long development windows for Alaska projects, much of the new oil production is still years away. “It’s very good news” but the state will stay stuck in a fiscal “ditch” at least for at least the next couple of years, said Sen. Bert Stedman, R-Sitka and Senate Finance Committee co-chairman, during the meeting. Still, state authorities said they’re encouraged by positive signs showing that investment in the oil and gas sector, a key driver of Alaska’s economy, is on the rise. In a first since 2014, the sector employs more people than it did one year earlier, said Neal Fried, economist with the Alaska Department of Labor and Workforce Development, on Jan. 22. About 9,250 people worked in the industry in November and December, a year-to-year increase of 100 jobs. The rise followed a long period that saw thousands of oil and gas workers laid off, helping make Alaska unemployment the nation’s worst, at 6.3 percent in December. North Slope oil prices that are critical for supporting industry operations — and revenue for companies and Alaska — sank after breaching $85 a barrel in early October, to current levels just above $60. Still, the recent prices are an improvement from previous years, creating a better environment for the industry, he said. “There’s been volatility, yes, but the price environment has improved a lot, even with the somewhat lower prices in recent months,” Fried said. The North Slope rig count is expected to reach its highest level in two decades, with an estimated 18 exploration and production rigs expected to operate this winter, said Graham Smith, permitting manager in the state’s Oil and Gas Division, in an email on Tuesday. That’s higher than the 17 rigs in 2014, a year of high oil prices, he said. ConocoPhillips, looking to develop the large Willow field, is leading the way with plans to complete its largest Alaska exploration season in 16 years, drilling six to eight exploration and appraisal wells this winter. Oil Search has said it is drilling two appraisal wells this winter to better understand how to develop its Pikka discovery. The large find has sparked industry interest in the relatively shallow and sprawling Nanushuk formation. Oil Search on Jan. 24 reported “encouraging” results from the first well it drilled this winter, with oil confirmed in “hydrocarbon-saturated, high porosity sand,” said Peter Botten, Oil Search’s managing director. The company, based in Papua New Guinea, has rapidly grown its Alaska operations over the past year. It boosted the workforce to more than 100 employees from just a few, after buying a stake in Pikka in late 2017. 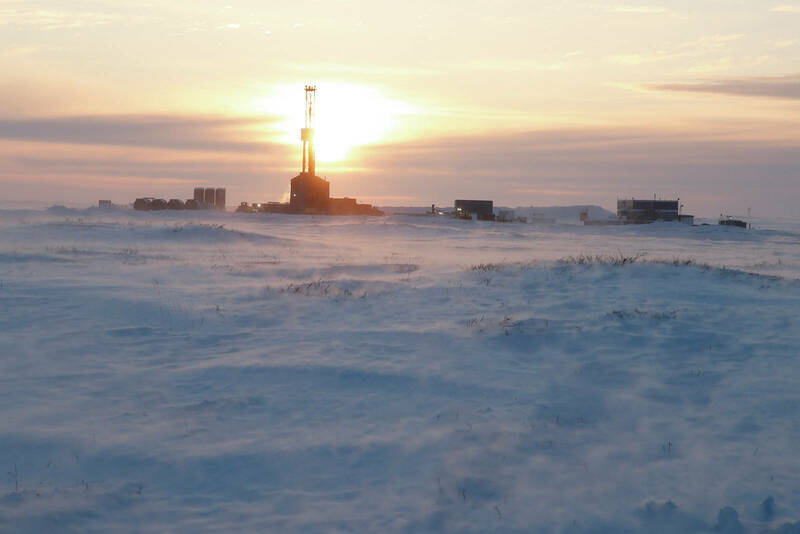 Also this winter, BP is conducting a large seismic shoot to better understand future production potential in the state’s main legacy field, Prudhoe Bay. “There is a lot more activity, which translates to jobs for people,” Walsh said. Smith said other positive signs of rebounding North Slope activity include a strong lease sale in November. The state received high bids of $27.3 million from oil companies, the third highest in the last 20 years. The extra activity doesn’t necessarily mean additional oil production, Walsh cautioned. “It doesn’t lead immediately to adding money to the state general fund, but it is an exciting indication” that the state’s fortunes are improving, she said. Oil production at Pikka and Willow, perhaps the state’s most promising discoveries awaiting development, aren’t expected to begin producing oil until about 2024. Production could reach about 100,000 barrels daily at each field, possibly more at Pikka. Tax write-offs associated with the cost of developing Pikka and Willow will lower revenue for the state, officials said. Also, at Willow, located on federal land, half the royalties would go to the federal government, and the rest would be set aside by law for distribution to North Slope communities, reducing state revenue. Over roughly 16 years, Willow could bring about $7 billion in revenue to Alaska, the state estimated. Pikka, on state land, could be worth about $10.5 billion during that length of time.